The Ma’rib Dam is an engineering marvel of the ancient world that is located in central Yemen. This dam is easily one of the finest examples of masonry architecture in the Arabian Peninsula. Local stories say the dam was in use for centuries, however, the great dam apparently stopped serving as a barrier when it was breached by rats. The Ma’rib Dam, also known as the Great Dam of Ma’rib, was in use for many centuries for the storage of water, as well as for irrigation purposes. During the 6th century AD, however, the dam collapsed, though the walls of its sluices are still standing today. A new dam, close to the location of the ancient one, was built during the 20th century. During the 1st millennium BC, Ma’rib served as the capital of the Sabaean Kingdom (better known in the West as Sheba), a pre-Islamic kingdom located in the south-western part of the Arabian Peninsula. The Sabaeans were a Semitic people who settled in the southern part of the Arabian Peninsula after migrating from the north at an unknown date. This kingdom flourished due to its position on the spice route that brought exotic goods from the East to the West. The kingdom was so dependent on this route that when the caravans stopped arriving during the 6th century BC, as a result of new trails, the Sabaean economy collapsed. Nevertheless, the kingdom continued to exist until the 3rd century AD, when it was conquered by the Himyarites. Traditionally, the Ma’rib Dam is said to have been constructed during the 8th / 7th century BC. According to inscriptions, the dam was built by a ruler named Sumhu’ Alay Yanuf and his son Yatha’-Amar Bayyin. However, a German archaeological expedition excavating one of the areas below the dam has revealed that this monument went through several phases between the beginning of the 2nd millennium BC and the 1st millennium BC. In any case, the Ma’rib dam was essential for the survival of the Sabaean Kingdom, as it provided water for its people. The Ma’rib dam consisted of a foundation of huge stones and an earthen wall plastered with stone and gravel on both sides on top of it. These walls reached a height of about 15 meters (49.21 ft.), and the thickness at its base was 60 meters (196.85 ft.) The dam ran 720 meters (2362.2 ft.) across the Dhana valley, from the northern mount of Balaq to the southern one. During two seasons between April and August, runoffs in the heights to the east would flow into the valley. The dam stopped the flow of the floodwaters, thus preventing flooding and storing the water for later use. Sluices were added at both ends of the Ma’rib dam, which allowed the collected water to be redirected into an irrigation system that made agriculture possible in the land. Over the centuries, the Ma’rib Dam was repaired and renovated. 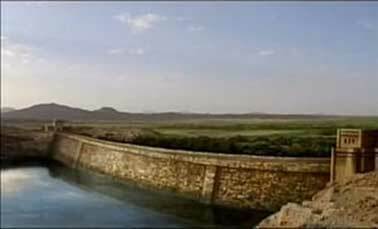 The dam was so important to the people who lived in the area that its maintenance continued even after the fall of the Sabaean Kingdom to the Himyarites. Eventually, this task became quite difficult because the techniques used by the ancient Sabaeans to maintain the dam were lost over time. The dam broke in 450 AD, and once more in 542 AD. The Himyarites repaired the dam on both occasions. In 570 AD, however, the dam broke for the third and last time. The cause of the collapse is a matter of debate amongst scholars. Some argue that it was an earthquake that destroyed the dam, whilst others blame it on exceptional rains. Yet local legends claim it was large rats that caused the breach by biting and scratching at the dam’s base. All that remains of the Ma’rib Dam today are its sluice gates, which stand as a testament to the engineering capabilities of the ancient Sabaeans. In 2015, these ruins were damaged by airstrikes during the ongoing conflict in Yemen.